Many of what we consider weeds are quite edible and can be used in salads or steamed veggies. This time of year I like to see what’s growing, both wild and in the garden that can be eaten. I can’t help but think of people in earlier days who depended on these wild spring weeds for survival. Here’s a few of them. Of course be careful that none of the greens or flower you eat have been sprayed with herbicide. Dandelion leaves. Dandelion leaves make a great addition to salad and they are typically plentiful enough that you just have to step outside. They packed with nutrients but are somewhat bitter. Pick them early in spring before they get too bitter. Spring mustards. Mustards are very prolific and can be found almost anywhere. Their flowers have 4 petals, not veined. The leaves are toothed. In my area now there are purple flowering mustards growing as well as some yellow flowering mustards. All mustards are edible, but some taste better than others. Here’s more about various wild mustards. Oregano. Oregano is not necessarily wild, or a weed, but it is quite prolific in my garden right now and goes great in a salad. Viola flowers (Viola tricolor). 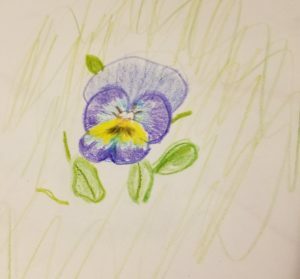 I love this tiny pansy that seems to look up at me with a smile. Besides putting them in a salad where they add nice color, I like to freeze them into ice cubes. Here’s more about edible flowers. Lambsquarters (Chenopodium album). I remember my father experimenting with wild foods and cooking up some lambsquarters for us when I was a kid. These need to be young and tender, so only pick the top few leaves. Here is more information on lambsquarters. Wild onions (ramps). While ramps do not seem to grow in Colorado where I live now, as a kid in Ohio we would harvest them all summer long. We were even known to go door to door selling them. I don’t remember if anyone really bought them, but I loved to dig them up and eat them. But now, I have so many chives that grow in the spring in my garden that those are a go to for spring salads. There is however another type of wild onion that grows in Colorado, but I am not familiar with it. You can read about it here. Bergamot (Monarda) flowers. You’ll have to wait just a little while for Monarda to grow enough to use, but the leaves and the flowers are edible and have a somewhat peppery flavor. I like to pull out the flower petals and use them in salad. Here is more on Mondarda. Purslane (Portulaca oleracea). Apparently, more commonly eaten in European countries than in the US, but it grows quite prolifically on my farm. Purslane leaves are very thick, similar to a succulent with its leaves dense with water. The flower is yellow. It can be eaten raw in a salad or steamed. Purslane is also very nutrient dense with high amounts of vitamin E and omega-e atty acid (linolenic acid). Here’s more on purslane. Wild Asparagus. Around here I can find wild asparagus growing along fence lines and ditches. In fact, right now is when I should be looking for it. It is smaller than cultivated asparagus, but very good. Here is an article on foraging for asparagus. 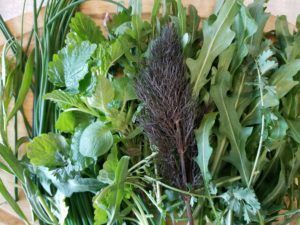 Are you eating anything wild, or from your yard this time of year? Did you like the salad at the time Angela? I love seeing bright colors and different textures in my salads, thanks for sharing this list! oh, yes, and flowers are nice to add colors! Wow, I did not know I could use these weeds in my salad. I will have to try this, thanks for this post. Great, let me know how you like them.